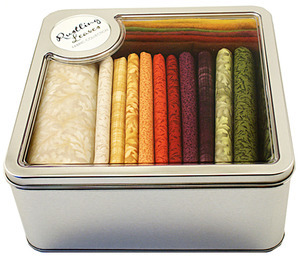 Stir the feeling of fall with this gorgeous autumnal fabric kit! Includes 12 cuts of,premium cotton fabric totaling over 4 yards! PLUS 6 felt color options for appliques, AND full cutting/assembly instructions! We used the Rustling Leaves fabric line designed by,Cheryl Haynes for Benartex, the Rustling Leaves (#E-CD1JL12) design collection developed,specifically to compliment the fabric line, along with the Rustling Leaves thread kit (#BE1207) and,our BREWER Exclusive AccuQuilt dies(#55389, #55390, #55390 & #55392).,**Backing fabric not included in kit. We used #0283222B Vining Leaves in Cranberry Pumpkin from,the Rustling Leaves line for backing on our featured quilt.